Motherhood is about sacrifice, and it is only the presence of the Holy Spirit that ensures the success of the servant’s mission. Moms, do you see yourselves as anointed messengers of the Good News in your home? The word “poor” in this verse can mean, “conscious of one’s spiritual need.” We live in a time where salvation is available to all…the time of the Lord Isaiah prophesied about. Our sweet little children…without Christ…are poor, blind, and oppressed…until they find their freedom and salvation in Christ. You, mom, are your children’s first point of reference to the Gospel. What are they seeing? Second, do you see yourself as a servant with a mission? I’m a huge fan of authenticity and transparency. I think we can’t improve our lives by acting like someone we are not or hiding our struggles, our failures, our doubts, in addition to sharing our wins. I grew up attending church. My parents took my brother and I to church, but we weren’t living a life on fire for the Lord. Honestly, I didn’t even know what that meant for so many years. As a young mom, I repeated the cycle of what I learned from my parents. I made sure my family went to church, but outside of that one hour a week, we weren’t doing much to die to self and live for Christ. My marriage suffered because of that, my parenting skills stunk because of that, and I found myself in a deep pit searching for answers to heal my past. God pursued me in that mess, and He sent a person to speak a word to me that only God knew. I didn’t know the person whom God had sent and he had no way of knowing what I was struggling with. At the age of 34, I gave my life completely to Christ. I said, “Wherever and whatever.” That wherever and whatever needed to first start in my home. At the time, my children were 5 ½, 3, and almost 1. They didn’t need me to change the world at the time, they needed me to change the atmosphere of our home first. My 15 ½-year old son’s response: “Feed, do laundry….” He couldn’t come up with a third thing. My 12-year old daughter’s response: “I have no idea.” Clearly, I am doing a great job with her! My 10-year old son’s response: “Raise their children in godly ways, teach them valuable skills they will use their whole life, and protect them (food, shelter, etc. ).” This third child truly is a gift from God, and he lives up to his middle name of Samuel! Moms, we are responsible for our children’s starting points. Just as we set them on the ground to take their first steps, so, too, should we set them on the right path to find Jesus. I get it, being a mom isn’t always that glamorous. Doing laundry, scrubbing floors and toilets, changing diapers, battling temper tantrums…it’s not the kind of stuff that makes headline news or gets your name into history books, but motherhood is a calling God has allowed in your life. Stop right there for a moment and read that again, “Motherhood is a calling God has allowed in your life.” God allowed it. God authored it. God created your child. From the moment of conception, our bodies begin to sacrifice…even before we realize we are pregnant. In utero, the growing baby takes some of our nutrients. The sacrificial process begins whether we like it or not. Mary said, “Yes!” The angel told Mary she was going to have a baby…a very important baby. And this baby wasn’t coming by the traditional means, but instead from the Holy Spirit, not her soon-to-be husband. Mary knew this could mean her death (because adultery was grounds for death and she was engaged to Joseph), but the angel of the Lord had already told her “the Lord has blessed you and is with you.” She didn’t fear man at this moment because she feared (or revered) God more, and she knew His promises to be true. “What do you think of when you hear, ‘Fear God, not man’?” Whom do you seek to please more…yourself, others or God? In verses 46-55, Mary sings a song of praise to God. She knew His promises to the children of Abraham. She would have known what the prophets said about the coming Son of God. She knew his life wouldn’t be easy, and therefore her life wouldn’t be easy. She was raising the son of God and Mary was responsible for that child just as we are responsible for our children. I have already mentioned Proverbs 22:6, “Start children off on the way they should go, and even when they are old they will not turn from it.” But what does this mean? It means a whole lot more than just taking your children to church. First point: Raise children in godly ways. The Hebrew word for “train up” or “start” is chanak. It means to dedicate. Many of us dedicate our children in a church setting (whether that be through baby dedication or in some cases, infant baptism). Mary did this with Jesus. This is our way of giving our child to the Lord for service, and confirming that we are agreeing to raise the child to honor God and teach them about God. We do this not only by going to church, but also by leading by example. We are all anointed ministers (or proclaimers) of the Gospel, so we need to know the Gospel. Knowing the Gospel begins with knowing Jesus. We discover things about Jesus by reading the Bible and spending time with Jesus through prayer. Mary and Joseph participated in the Jewish customs and traditions and traveled for the festivals (remember the story where they lost Jesus one time?!?!?). She didn’t stop doing these things or bringing Jesus along just because Jesus was the Son of God. You and I are no different. 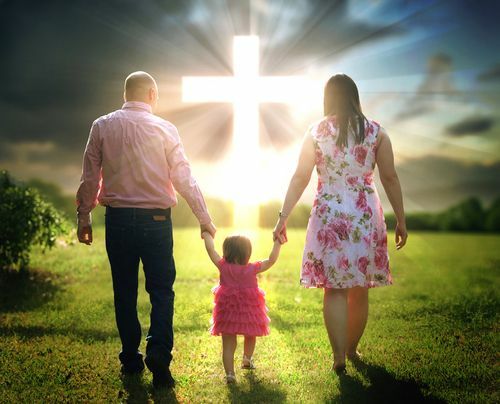 I see so many today who think their children will have a saving faith because they do or they say, “Someday they’ll all get back into church when things slow down.” Sadly, so many children are in danger of slipping away from the Kingdom before they’ve even had a chance to enter the Kingdom because they are banking their salvation on their parent’s faith. We’ve got to be intentional with our children and let them know that their faith is theirs. It’s personal. Yes, there’s a greater likelihood your child will be saved if you and your husband are saved, but it’s not a guarantee. I know a lot of adults desperately waiting for prodigal adult children to come home because they neglected to raise their children in godly ways. It’s heartbreaking to watch. As your little ones start to venture out more and more from your care as they enter the school aged years, they are going to be getting a lot of “culture” thrown at them. Your job as parents is to make sure their foundation is secure…this includes securing your own foundation because for a little while, they are tethered to you. What we start, our children will start. If we are on the right path, our children will start on the right path. If we aren’t on the right path, our children won’t start on the right path. Some of you reading this right now may not be on the right path. But take heart, you can make the choice to get on the right path today, and place your children with you on that path. Let me assure you it is much harder to put your child on the right path when they are walking and running on their own. If your child is still young, make the choice to put him or her on the right path while you still carry him or her on your hip and in your arms. What are you teaching your children both directly and indirectly? What do your children see as important to you? By making our mission known to our children, we set expectations for what we expect from them, as well as confirming what we believe and are also doing. Our family mission statement teaches them what our only priority is (our relationship with Jesus). We say “only” in our house because if we number our priorities (God, first, family, second, work, third, etc. ), we can re-order our priorities from time to time. It’s fine to number all the priorities other than God, but He must remain the constant priority at the center of your family. God will allow you to move Him from the center or first, but the result usually isn’t pretty. You and I aren’t just raising the next great soccer player, football player, ballerina, CEO, lawyer, doctor, or pastor. No, we are raising Christ-followers who just so happen to have the talent and gift for sports, leadership, medicine, preaching, and the like. We shouldn’t be so focused on training them for an occupation that we miss the ultimate calling, to be eternally focused in all areas of their lives. This “aha moment” for them can come sooner rather than later if we are sacrificing our time and energy to teach them the ways of the Lord. In Psalm 86:11 David prayed, “Teach me your ways, O Lord.” Until your child can learn to pray and ask God directly for understanding, they rely on you. I watched a PureFlix movie on Friday night called Coffee Shop. It's a cute little romantic movie. In it, the main character was describing her late mother to someone she had just met. She said, “My mom was always talking about the Bible and loving others.” This woman had watched her mom live out the two greatest commandments: “Love God. Love Others.” She, in turn, was living a life that very much reflected the same things. People knew this woman loved God and loved others. What is it that your children will remember being taught or lived out by you? What’s caught is because it’s taught. Let me clarify something, this doesn’t mean we answer to every whim and give up ourselves for the sake of our children. We want to train our children to be servants not just people to be served. There is a fine balance between sacrifice and self-care. If we aren’t daily being filled with the Holy Spirit and have not daily put on our own armor of God, we can’t help our children put on theirs. We can only serve out of the overflow of what’s in us. If our relationship with God is right, it helps our closest relationships be better because our filter now has a God lense on it. We need to teach our children about who God is, we need to teach them about Jesus’ character, and we need to teach them about what is and isn’t expected of a Christ-follower. Our children are our disciples. If we are to go out and make disciples, we can’t neglect those in our home who need discipling. We can’t delegate this task…especially in their younger years. We demonstrate discipleship for them so that hopefully, one day, they will disciple others just as Jesus commanded in Matthew 28:19, “Go and make disciples of all people.” The choices we make in our homes influence not only our lives, and our family’s lives, but also all those who we, and they, will encounter throughout our lifetime. If we are teaching our children valuable skills…life skills, social skills, discipleship, worship, prayer, doing life in community…they will last a lifetime. We want our children to model this kind of behavior not the behavior of some of the television families we see or sadly, some of the families of children they do life with at school, sports, church, etc. We can’t force our children to accept Christ, but we can teach them what it means to follow Christ, why it’s important, and age appropriate, what it looks like when we don’t follow Christ. We need to train our children to not be fools, but to seek wise counsel and be okay with being the student…the disciple. We need to not think their rebellion is cute (it might look cute at two years old, but I can assure you that it doesn’t look cute once that child is 12 or 16). We are responsible for teaching our children that obedience to God is for their benefit and well-being (this helps them understand why it is important to obey) and to love others. Did you know the lioness’ job is to provide food, shelter, and nurturing to the young cubs? The lion doesn’t help with any of that. The lioness’ goal is to grow the cubs so that they can go out and start the cycle all over again. We do that, too, moms. We do lots of grocery shopping, meal preparation, patch up boo-boo’s, nurture tender hearts, and raise our children in community (like what you all are doing here). If we neglect to feed our children, provide shelter for them, and protect them, harm could come to our children. What we do is like the shepherd who tends his flock. The sheep know their shepherd’s voice just as our children know our voice and nuances, and we know theirs. We shepherd our homes. We must keep the enemy out even if that means staying up nights to keep guard. It’s sacrificial. Protecting our children also means that we sometimes must say, “No.” “No’s” aren’t always fun, but they are often necessary. We shouldn’t strive to be the “fun mom” or the “best friend.” Fun runs its course and friends come and go. Moms, you need to remain steady and constant. As my husband said, it’s the mom’s job to set the comfy, peaceful culture of our homes. The tone you set each and every morning can impact your family’s entire day. Find joy in the calling because of who called you to your calling and equipped you, through the Holy Spirit, for your mission. On your bad days (we all have them), don’t take things out on your kids or your spouse, take it all to Jesus. He gets it. Take your weariness to Him and He’ll carry it. Lastly, I don’t want you to think that being a mom is the only thing you are called, qualified or capable of doing. Your family should be your focus, but don’t be so focused on your family that you don’t do anything else. Some of you may or may not work outside of the home. These suggestions don’t incorporate the work/mom balance. I don’t know how working moms get it all done…it’s amazing, and I haven’t worked outside the home for a paycheck since I had my first child. I don’t even want to venture into talking about an area I have no knowledge or experience in. Some of you may be called to work outside the home. But regardless of whether you work or don’t work outside the home (“work” as I use it here is defined as something that earns you a paycheck), you can also do the following: Love your spouse well. He was your love before your child came along. Be sure and nurture that relationship. You can volunteer. Find places where your children can get involved with you in serving. This way you are modeling serving people outside of your home. Serve in your church. There’s no better training ground than for your children to see you committed to, and participating in, your local church. Involve them when it is possible. If you don’t have opportunities where families can be involved together, maybe talk to your church about that or seek out organizations that allow families to serve. Teach your children to give. Help them understand why it’s important to give sacrificially of their own money and time without expecting recognition in return. Serve your neighbors, friends, and extended family. Even if they are not involved, they’ll see you preparing meals, delivering meals, babysitting a friend’s child, helping a sick family member. They’ll quickly learn the world doesn’t revolve just around them. Minister to your child’s friends and their families. Your child’s friends and their families may never step foot in a church. You might be the only church they ever witness. Make sure your life serves as a strong witness reflective of the person of Jesus Christ. Spend time with friends who are like-minded and build you up. It’s okay for the occasional girl’s night out, but make sure you are doing things you wouldn’t mind your children watching you do. Just because we are adults, it doesn’t mean we should be doing some of the things moms are doing. Assess your foundation and make sure it’s rock solid because raising children in this world is hard work on the mission field. The sacrifice of a mother begins long before we even realize they are ours, and it goes on and on. 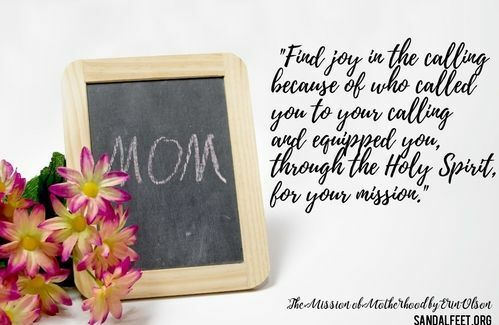 Commit to not only being a mom but to be a mom on mission. This mission is not just about your child’s soul, but also for the unknown number of people who will be impacted by your sacrifice in the years to come. And remember to always love God and love others.